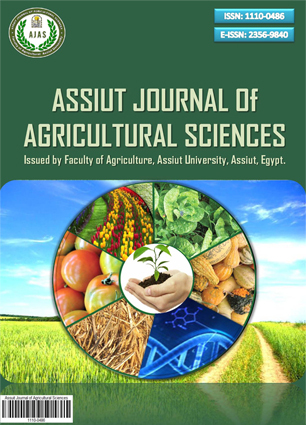 2Agronomy Dep., Faculty of Agric., Assiut University, Egypt. A field experiments was carried out during of 2014/15 and 2015/16 seasons in the Experimental Farm, Agricultural Research Station of El-Kharga, New Valley Government to study the effects of partially substitution of chemical NPK fertilizers by biofertilizers on two barley cultivars production under New Valley conditions. Seven fertilizers combinations were tested as follows: F1: 100% of recommended NPK fertilizers, F2: 75% of recommended NPK fertilizers + Microbein, F3: 50% of recommended NPK fertilizers + Microbein, F4: 75% of recommended NPK fertilizers + Algae extract, F5: 50% of recommended NPK fertilizers + Algae extract, F6: 75% of recommended NPK fertilizers + Algae extract + Microbein, and F7: 50% of recommended NPK fertilizers + Algae extract + Microbein. Number of spikes m-2, number of grains spike-1, weight of 1000-grains, weight of grains spike-1, biological yield fed-1, grain yield fed-1, straw yield fed-1, and harvest index (%) were recorded at harvest. Results indicated that the superiority of Giza 134 cultivar over Giza 132 cultivar was confirmed for most studied traits in both seasons. Double-inoculation of Algae extract and Microbein plus 75% of recommended mineral NPK fertilizers represents 10.14, 18.50 and 16.19% increases in grain, straw and biological yields of barley in the first season; 8.91, 29.42 and 22.15% in the second season, respectively; compared to the application of 100% of recommended mineral NPK fertilizers alone. Giza 134 cultivar fertilized with 75% chemical NPK + Algae extract + Microbein (F6) gave the highest grain yield (2.69 and 2.97 ton fed-1) and biological yield (8.38 and 9.43 ton fed-1) followed by 50% chemical NPK + Algae extract + Microbein (F7) with the same cultivar (2.53 and 2.88 ton fed-1) and (8.16 and 8.95 ton fed-1), respectively. It can be concluded that replacing 25 or 50% of chemical fertilizers by double-inoculation of Algae extract + Microbein as biofertilizers to improved yield and its components of Giza 132 and Giza 134 cultivars as well as saving about 25 to 50% of recommended dose of NPK. عند الحصاد تم تقدیر عدد السنابل فی المتر المربع، عدد حبوب السنبلة، وزن 1000 حبة، وزن حبوب السنبلة، محصول الحبوب والقش والمحصول البیولوجی للفدان وکذلک دلیل الحصاد. أوضحت النتائج تفوق الصنف جیزة 134 على الصنف 132 فی معظم الصفات المدروسة فی موسمی النمو. 1- التلقیح المزدوج بکل من المیکروبین ومستخلص الطحالب مع إضافة 75% من الکمیة الموصی بها من سماد NPK المعدنی أدى لزیادة محصول الحبوب والقش والمحصول البیولوجی بنسبة 10.14، 18.50 و16.19% فی الموسم الأول و8.91، 29.42 و22.15% فی الموسم الثانی، على التوالی مقارنة بالمعاملة ١٠٠% من السماد المعدنی الموصی به. 2- تسمید صنف جیزة 134 بمعاملة التسمید 75% سماد NPK معدنی + میکروبین + مستخلص طحالب أعطى أعلى محصول حبوب (2.69 و2.97 طن للفدان) والمحصول البیولوجی (8.38 و9.43 طن للفدان). فی حین جاءت معاملة التسمید 50% سماد NPK معدنی + میکروبین + مستخلص طحالب مع نفس الصنف فی المرتبة الثانیة، حیث أعطت 2.53 و2.88 طن حبوب للفدان و8.16 و8.95 طن محصول بیولوجی للموسمین الاول والثانى على التوالی. مما سبق یمکن التوصیة باستبدال 50% من الأسمدة الکیماویة (NPK) عن طریق التلقیح المزدوج بکل من المیکروبین ومستخلص الطحالب کأسمدة حیویة لتحسین المحصول ومکوناته لصنفی الشعیر جیزة 132 و134 بالإضافة إلى توفیر حولی 50% من الأسمدة الکیمیائیة الموصی بها.